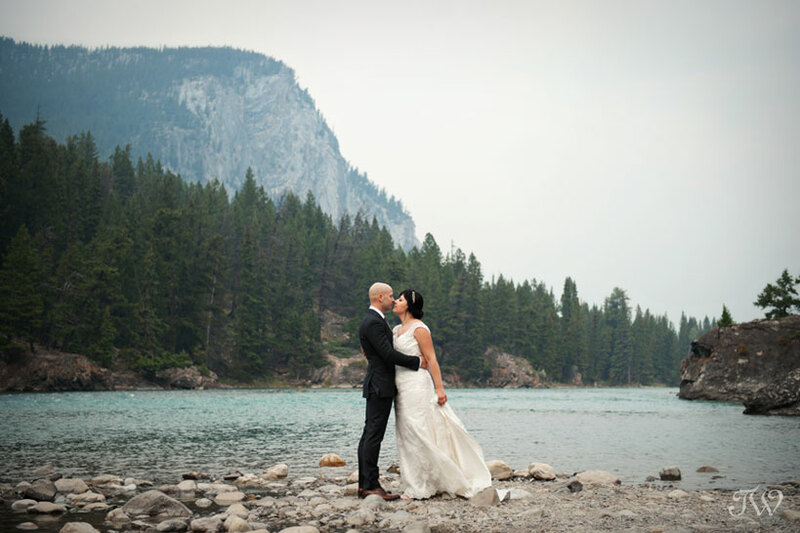 Smoke or no smoke, Tunnel Mountain Reservoir was spectacular for Elizabeth and Ron’s Banff vows on Friday. 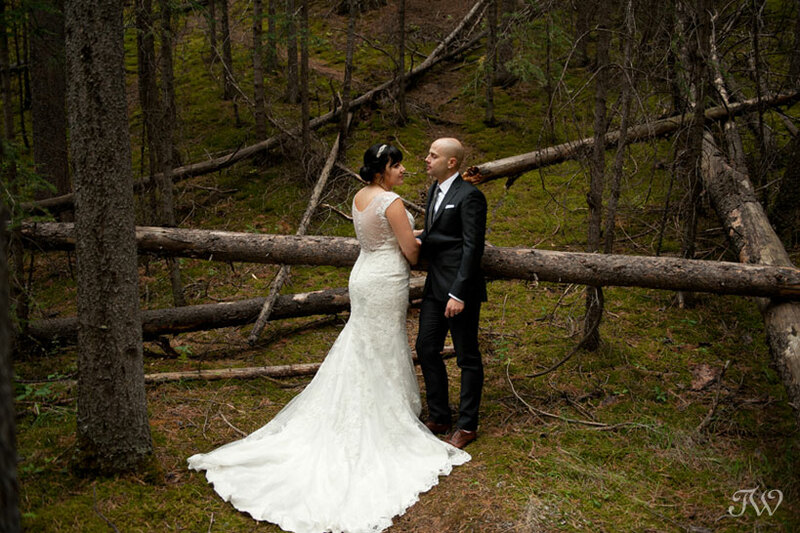 After they said “I do”, we went traipsing through the woods to find the perfect locations and here’s the sneak peek from our adventures. Congratulations Elizabeth and Ron! 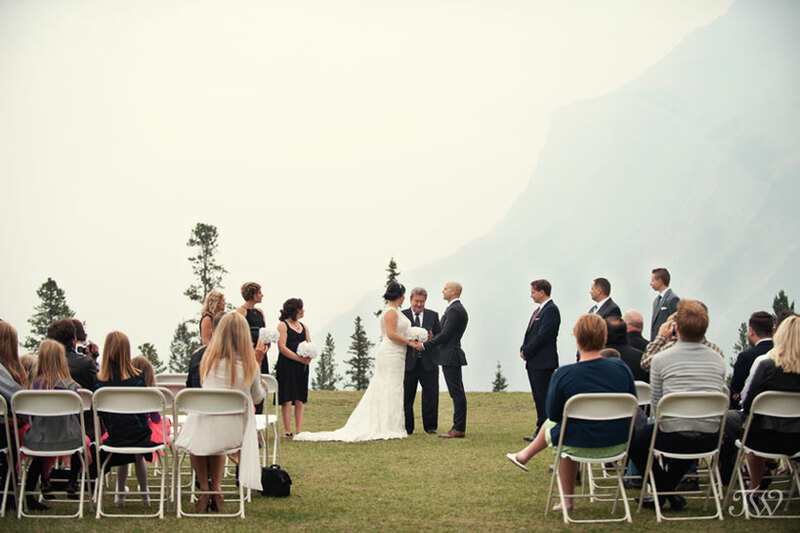 Here’s another Banff wedding held at the Fairmont Banff Springs a few years ago, if you’d like to see. 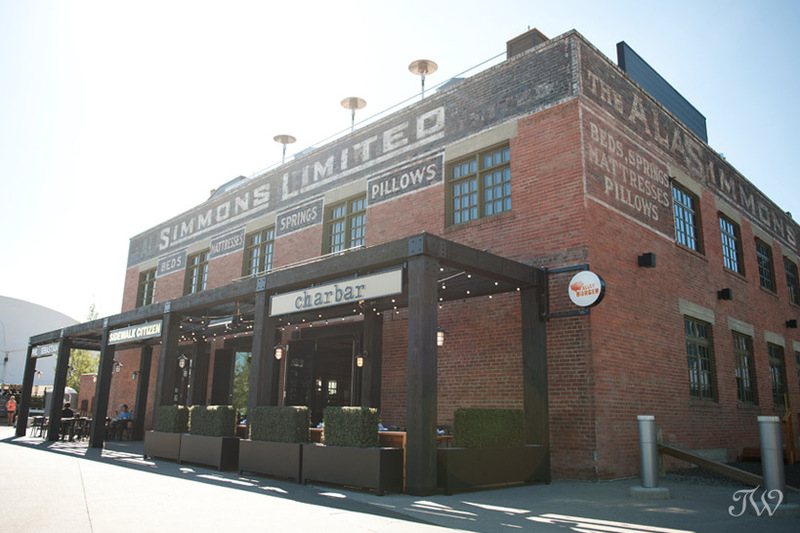 Unless you’ve been living under a rock, you’ve heard all of the buzz around Calgary’s latest restaurant, Charbar. 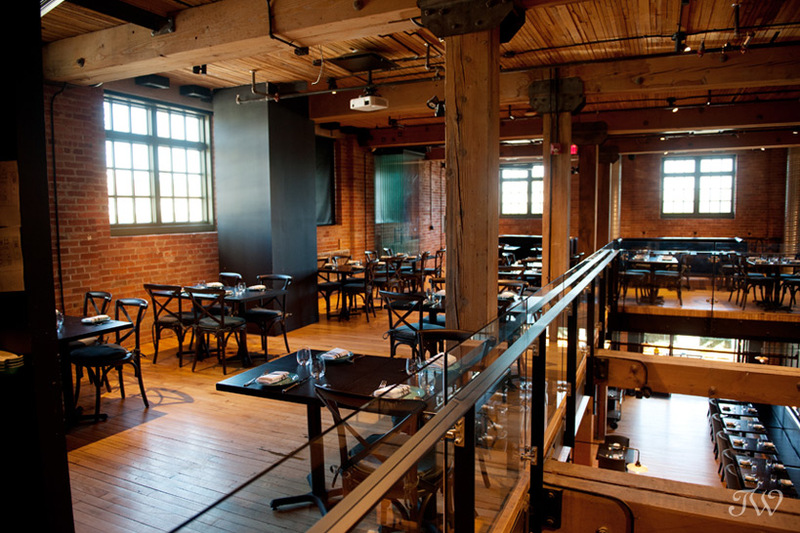 Located in the historic Simmons factory, it is the perfect combination of Alberta charm and delicious cuisine. The great news is that Charbar is available for weddings. 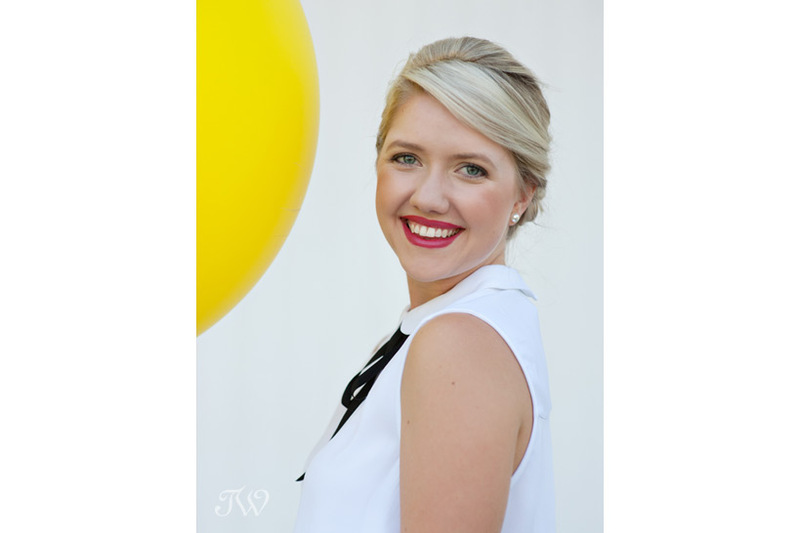 Last week I met with Chrissy from Charbar to learn about this unique wedding venue. Tell us about the history of the space? 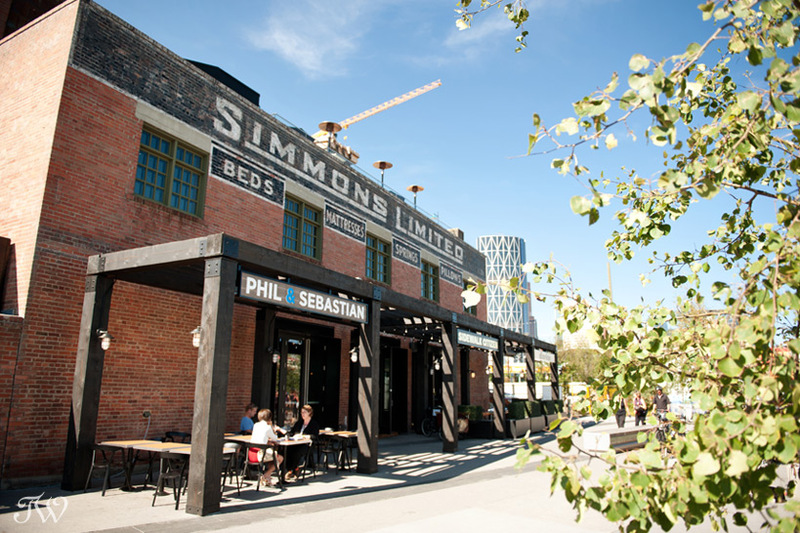 The Simmons is located along the picturesque Bow River in the newly developed East Village Community, which is home to numerous iconic Calgary buildings and surrounding amenities. 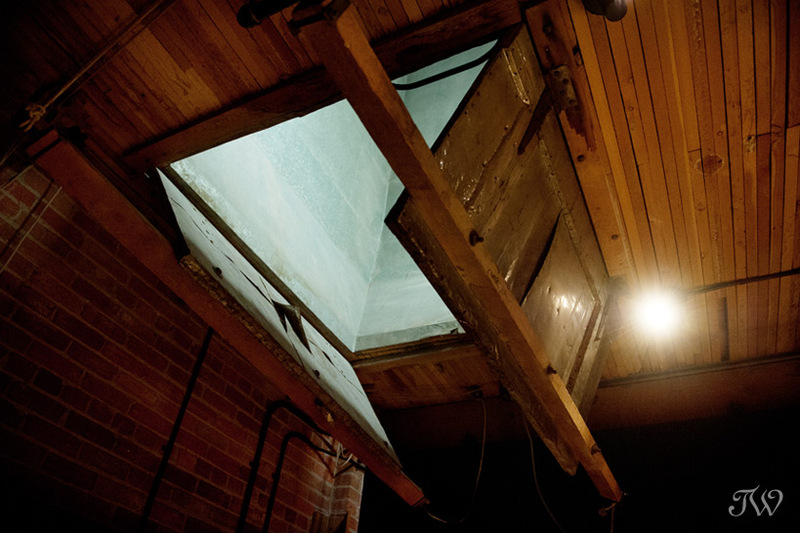 The 103 year old two storey building boasts original woodmill construction floors, exposed brick, tall fir posts as well as the original windows and feather shoot installed by the Simmons Mattress Factory in 1912. The Simmons factory produced matresses for hospitals via ABC Bedding Co. and became well known for their signature Simmons Beauty Rest line during this time. During World War II, the Simmons Factory provided mattresses for the military and occupied the space until 1966. It remained vacant until it was used as offices for the City of Calgary before turning the keys over to the CMLC for redevelopment. The new development showcases urban modern touches while maintaining the historical charm of the original structure. The Simmons Building is also home to two other local businesses: Phil & Sebastian Coffee Roasters and Sidewalk Citizen Bakery. The collaboration of all three businesses under one roof creates a truly decadent and memorable experience for your guests. The new National Music Center, the upcoming Central Library, Fort Calgary and St. Patrick’s Island are a few of Charbar’s notable neighbours. What are some features that make Charbar unique as a wedding venue? 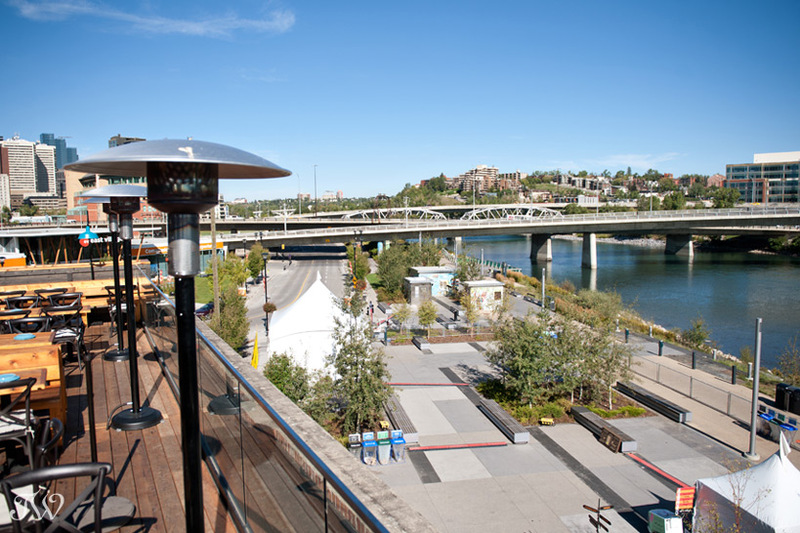 We have retrofit the building with modern amenities that blend into the backdrop of the historic elements. We have a state-of-the-art audio/visual system, glass partition walls for privacy, as well as gorgeous Le Creuset dinner wear. 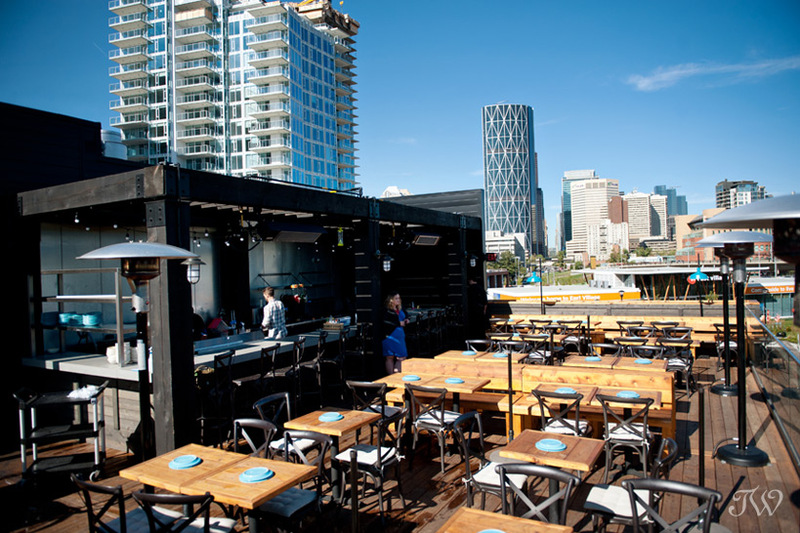 This is a venue unlike anything else in Calgary! 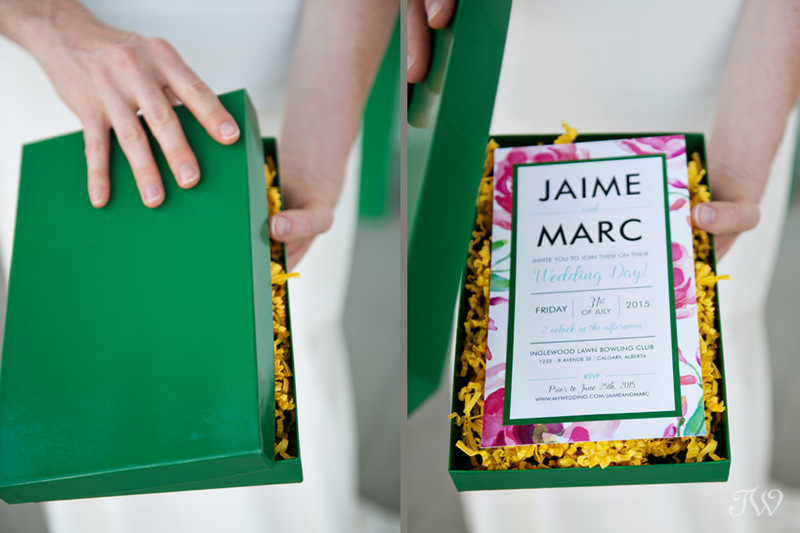 Every aspect of your wedding can be customized to your specifications. Our experienced event team will ensure a seamless event from musical styling, custom menu planning, professional service, and décor. 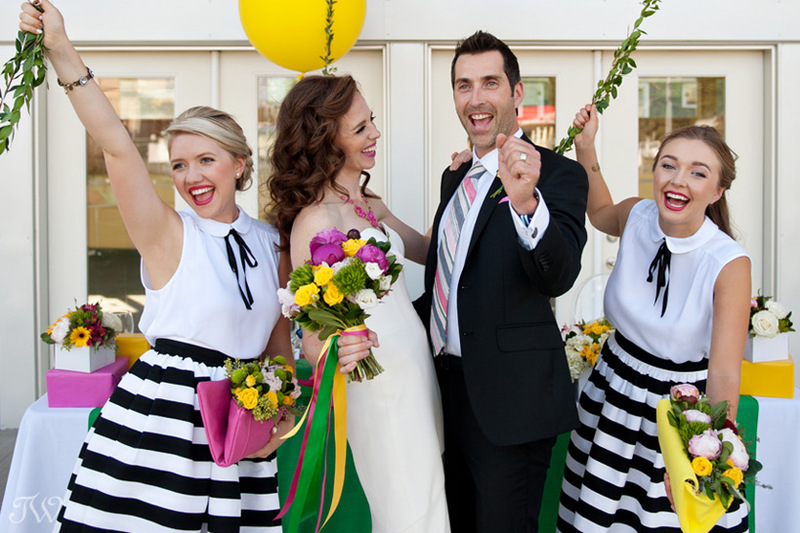 What type of wedding is your space ideal for? 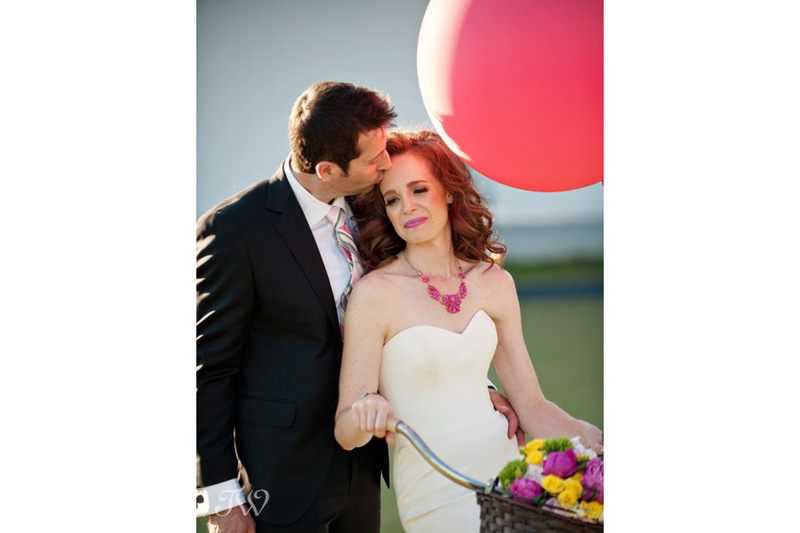 Charbar is a fabulous venue for every type of wedding. From an outdoor ceremony on our gorgeous rooftop with panoramic views overlooking the city, to a seated dinner on our second floor event space, exposing the charming backdrop of brick walls, wood beams and original hardwood floors. 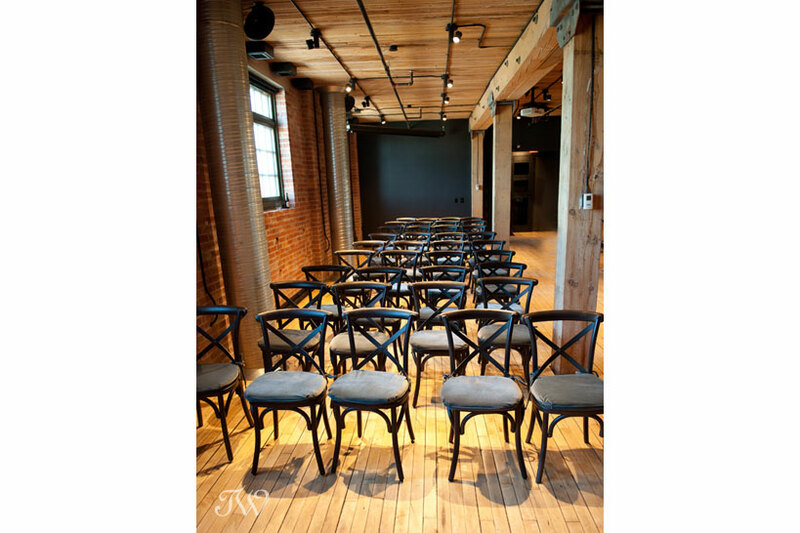 Charbar is a modern and luxurious addition to Calgary wedding venues. 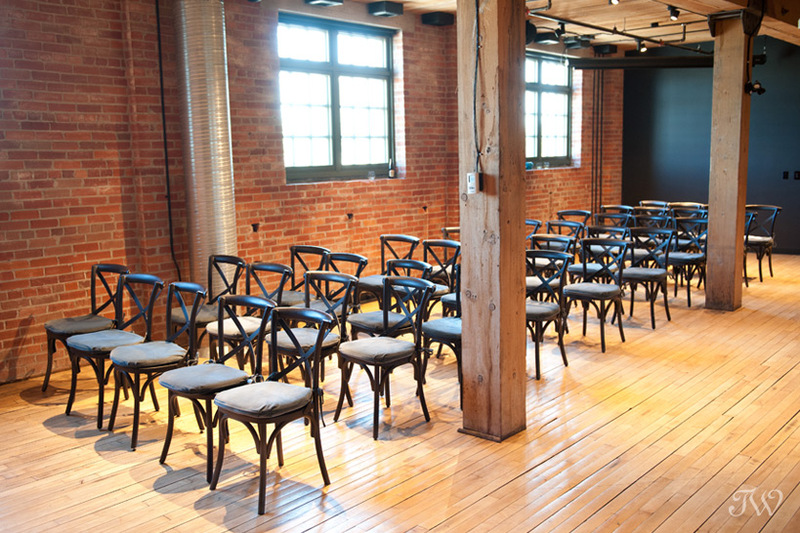 The space lends itself to rustic timeless décor, but can also be transformed to any couple’s modern wedding style. 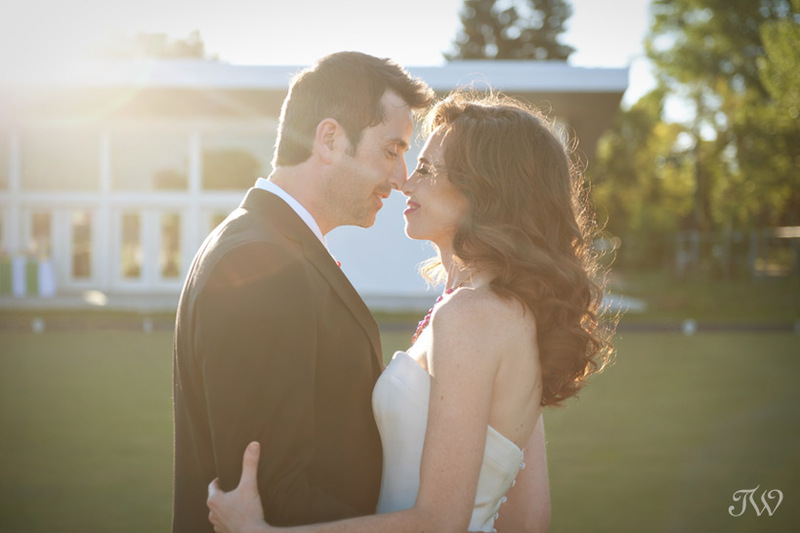 We can host intimate weddings of 10 guests as well as cater larger weddings up to 300 guests. 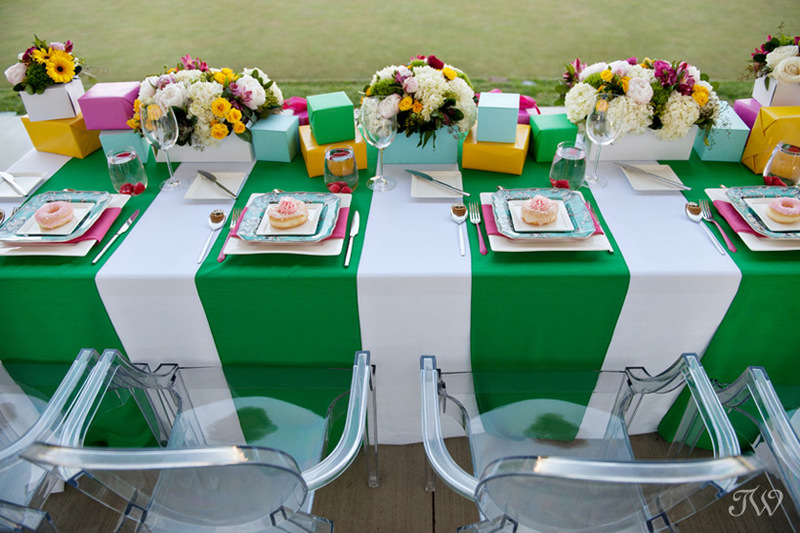 We have hosted ceremonies, receptions, rehearsal dinners and engagement parties. 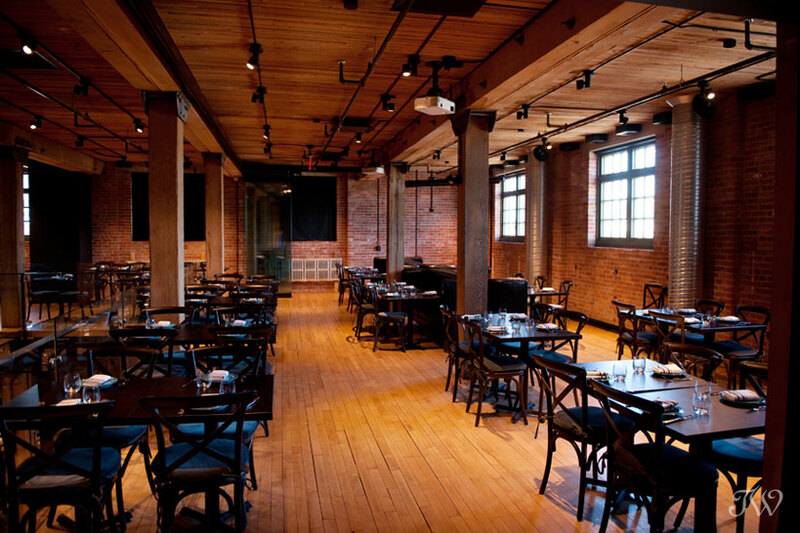 Charcut and Charbar are known in Calgary for fabulous cuisine. Are their special menu options available to wedding couples? 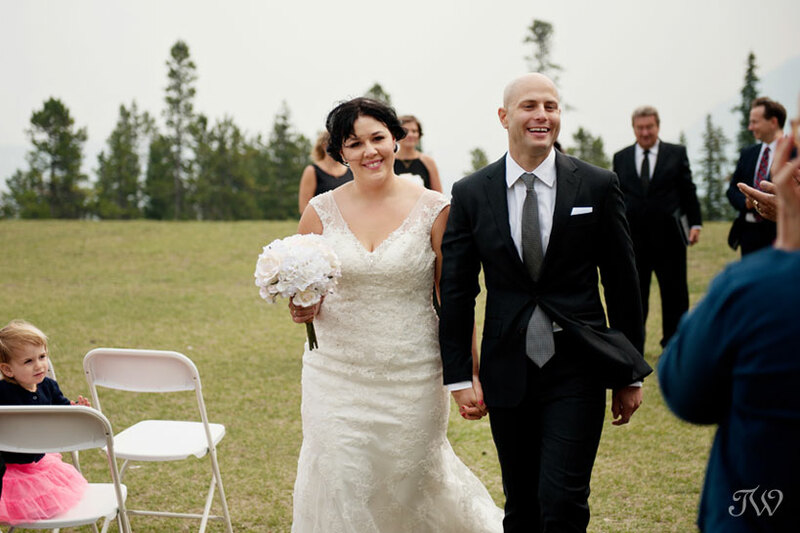 Chef Jessica Pelland and Chef Mike Batke work together to create specialized menus that pair perfectly with your event. 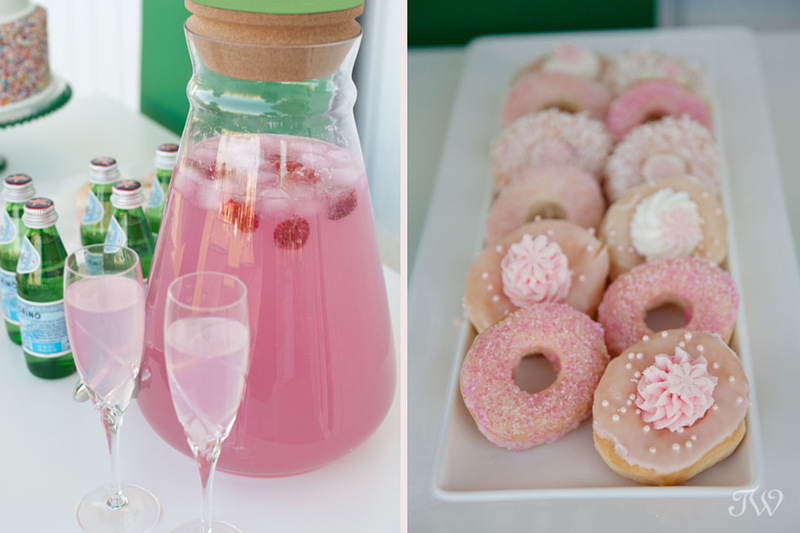 Any theme, dietary restriction or menu format can be accommodated in each of our private event rooms and on our rooftop patio. You can also choose items from the Argentinian-inspired Charbar menu, featuring our Parrilla wood-fire grill, which is the heart of our kitchen. The added touches and fine details – like freshly-baked Sidewalk Citizen Bakery bread and premium coffee service by Phil & Sebastian Coffee Roasters – are what make Charbar events unforgettable. From dinner buffets to midnight Alley Burgers, we are passionate about custom catering every part of the experience. The view from the rooftop is so spectacular. 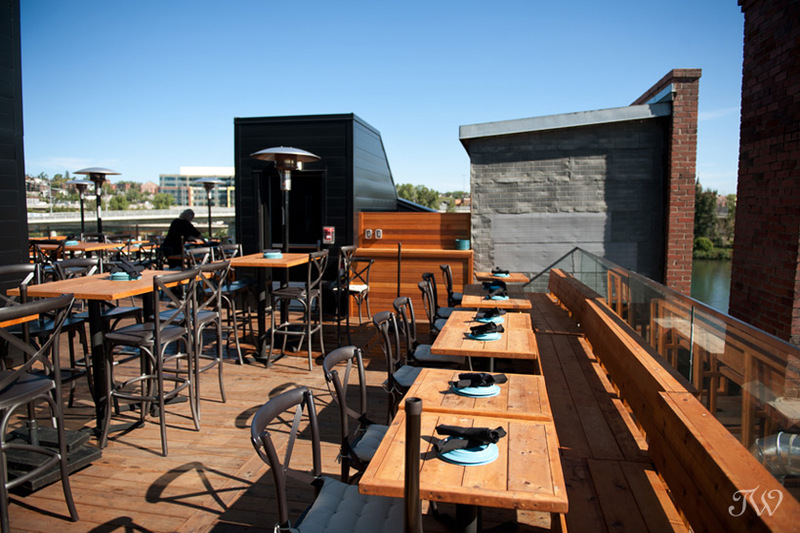 Can the rooftop patio be booked for weddings? Yes of course! 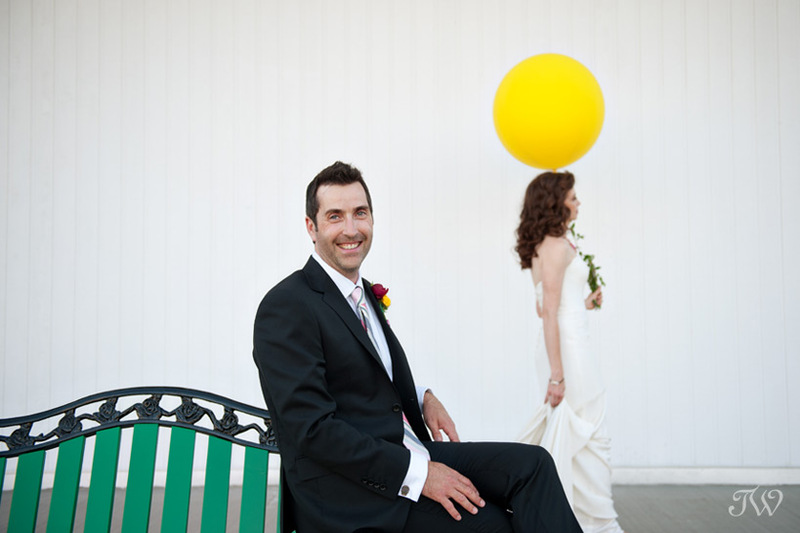 We have booked the rooftop patio for many ceremonies and receptions already. 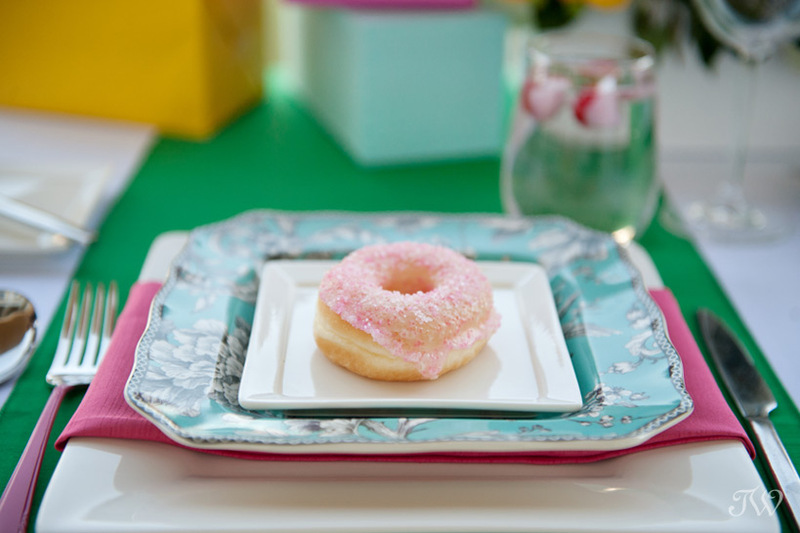 It is definitely a show stopper for any wedding. 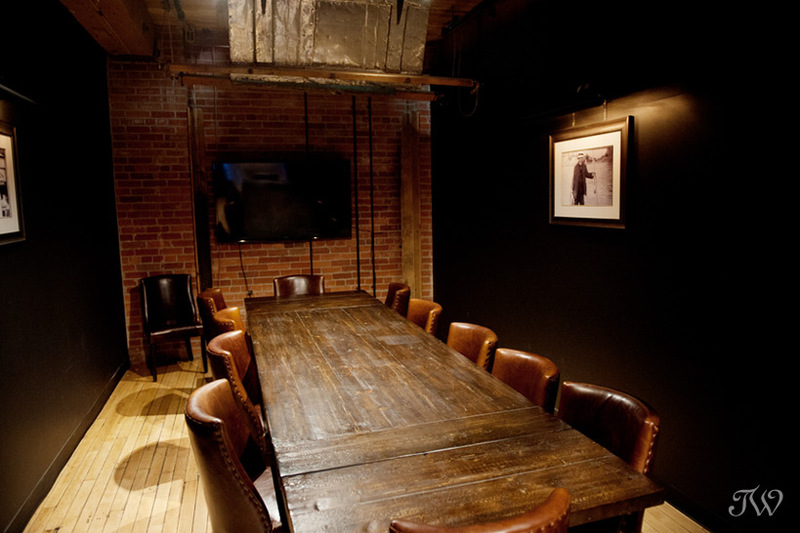 A private dining room on the second floor that includes the feather shoot, original to the factory. Any message that you would like to pass along to couples looking for the perfect place for their wedding? When looking for the perfect space it should fit within the style of who they are as a couple. 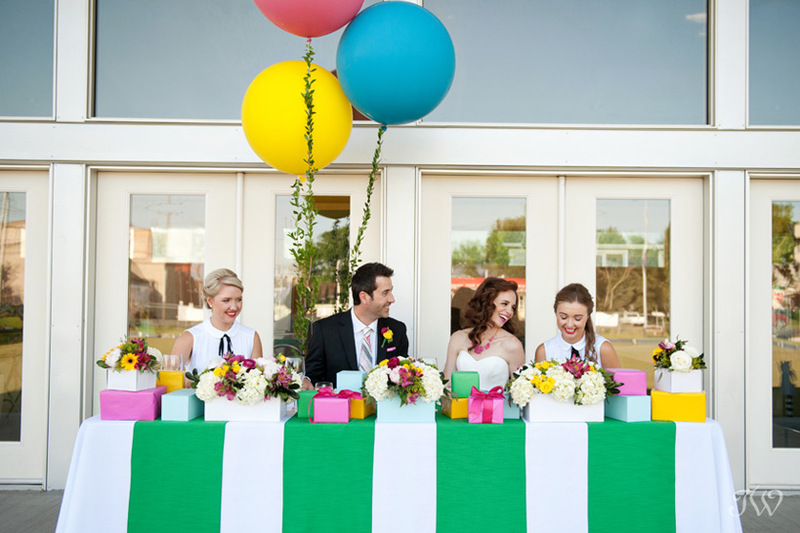 Also, look for unique touches that will set your wedding apart and an event planning team that you can trust. Thanks to Chrissy and Charbar for having me. 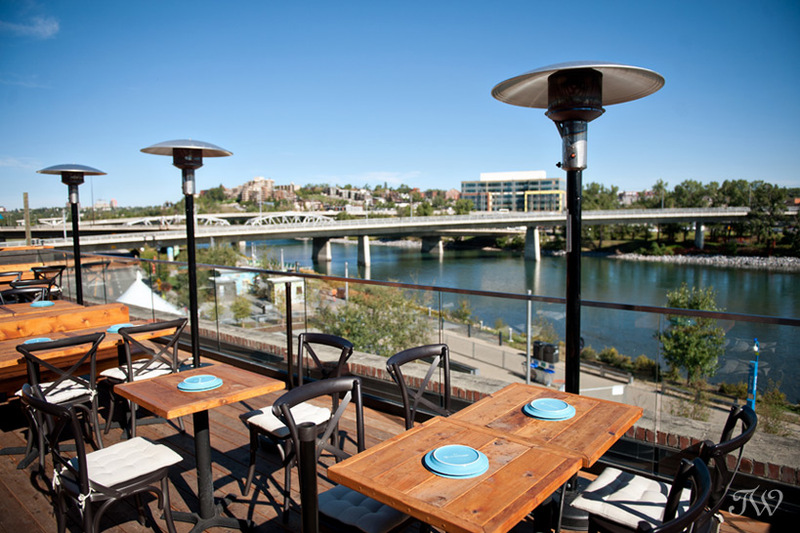 Be sure to check out this beautiful new venue. I’m looking forward to photographing my first wedding there soon. My name is Tara and I’m a colour junkie. Lately I’ve been so inspired by the vibrant hues I see on my favourite design blogs. 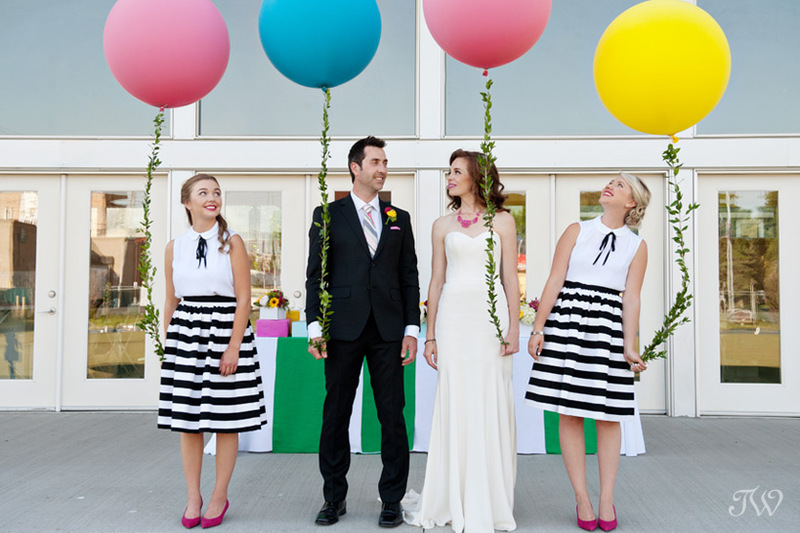 I came to Kari at Knot Planning with the goal of bringing colourful wedding ideas (and a hint of sophistication) to a Calgary bride and groom. 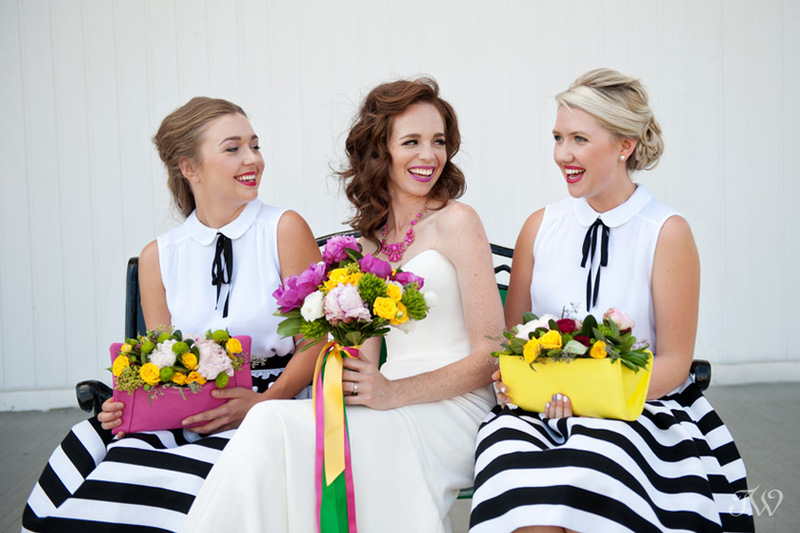 Together we curated wedding details that are beautiful, fanciful and fun, all at the same time. 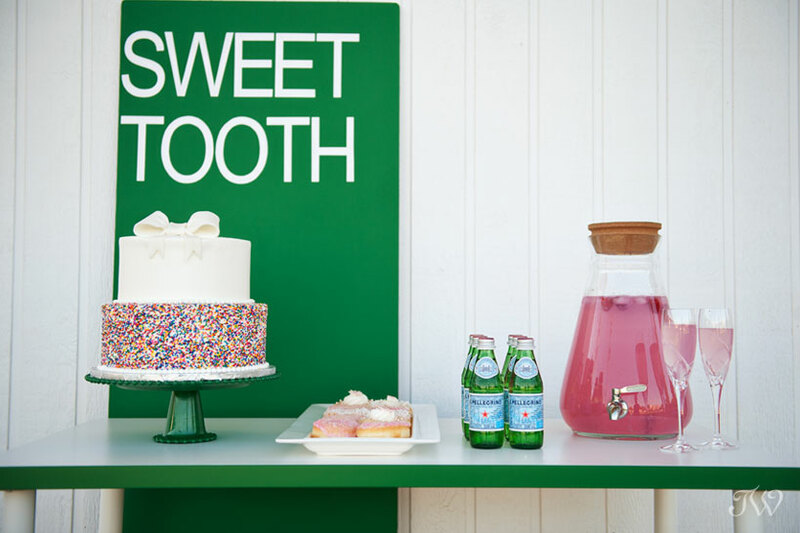 I like to think of it as “Kate Spade meets Wes Anderson”. 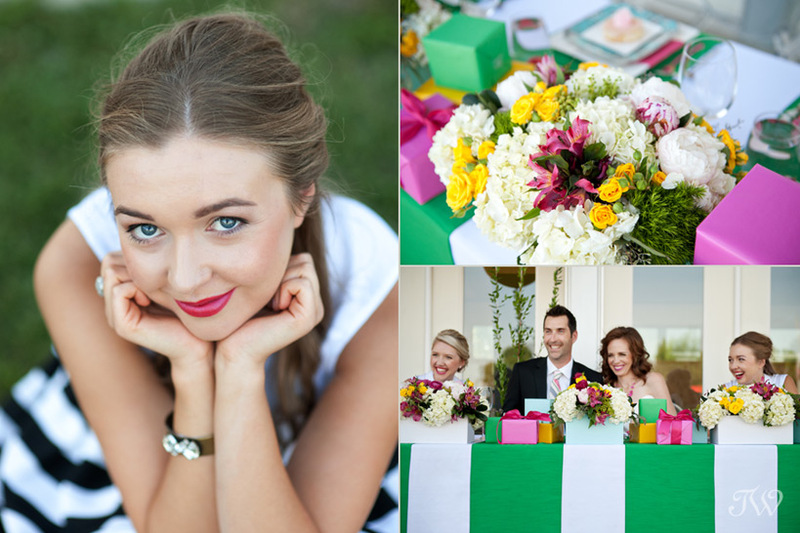 Enter several of my favourite wedding vendors and the freshly-cut grass of the Inglewood Lawn Bowling Club and voila! 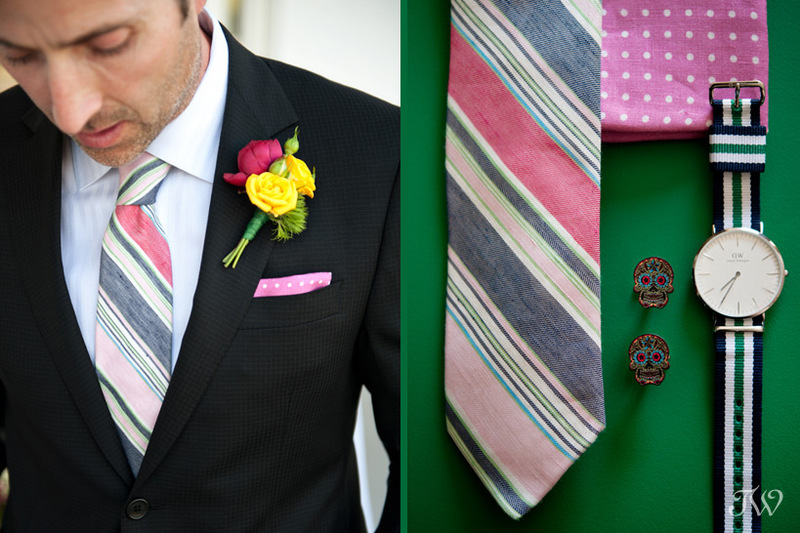 A playful palette blending shades of green, pink, yellow and turquoise. 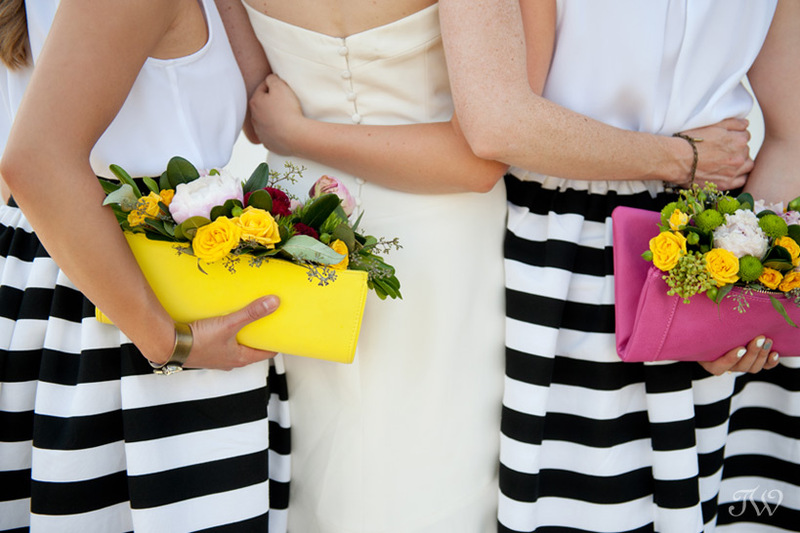 Bridesmaids carrying floral clutches from Sarah Mayerson Design in contrast to their bold, striped skirts from Adorn Boutique. 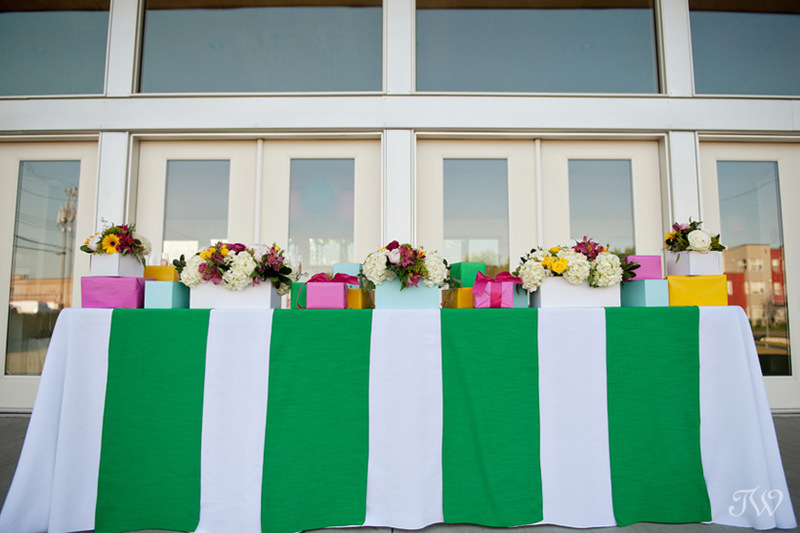 A selection of multi-colored boxes, filled with flowers from Sarah Mayerson Design and stacked to perfection as the centerpieces on the head table. 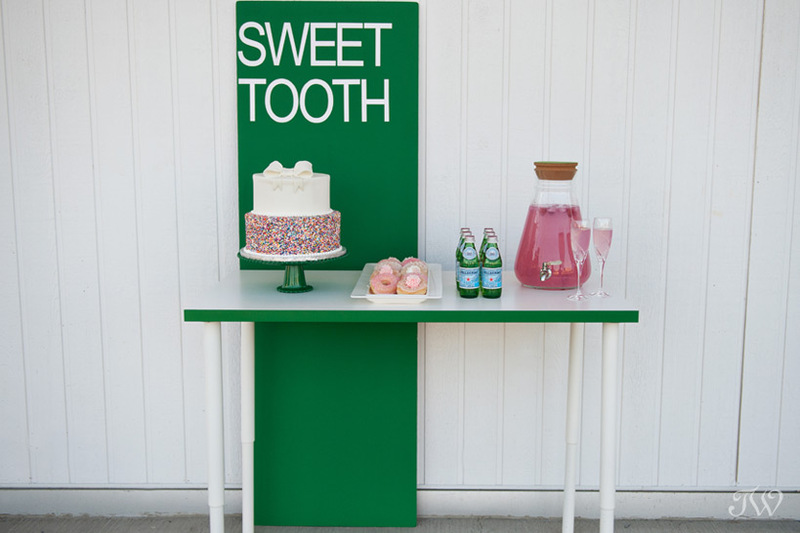 A graphic “sweet tooth” backdrop for the dessert table, which included pink lemonade, donuts from Jelly Modern and a sprinkle-covered wedding cake by Cakeworks. 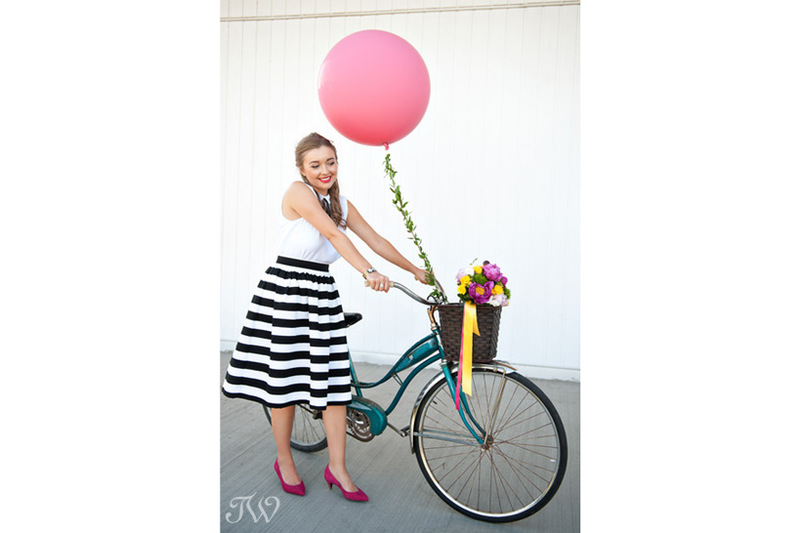 Whimsical design elements such as a vintage cruiser, an emerald green park bench and giant balloons with vine-wrapped strings. 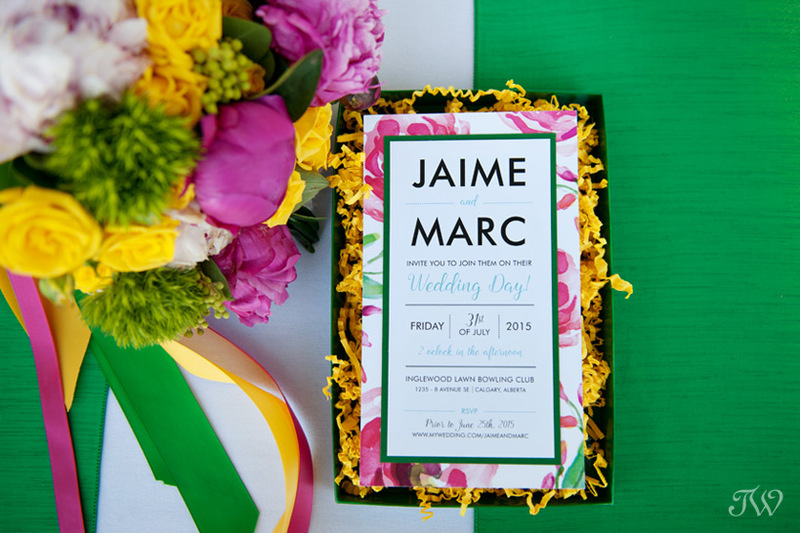 A graphic, boxed wedding invitation from Modern Pulp Design Studio. 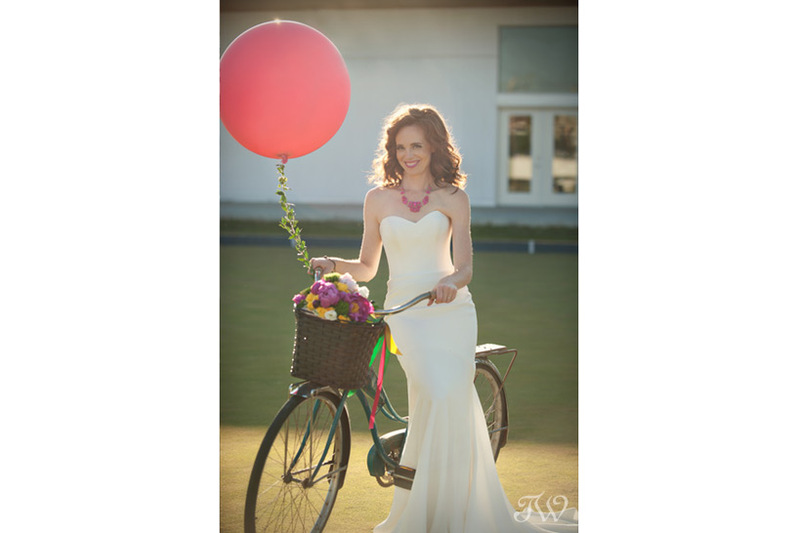 Give a hand to all of the vendors who made this shoot possible! Thank you to our fabulous models Jaime, Marc, Lindsay & Christine! 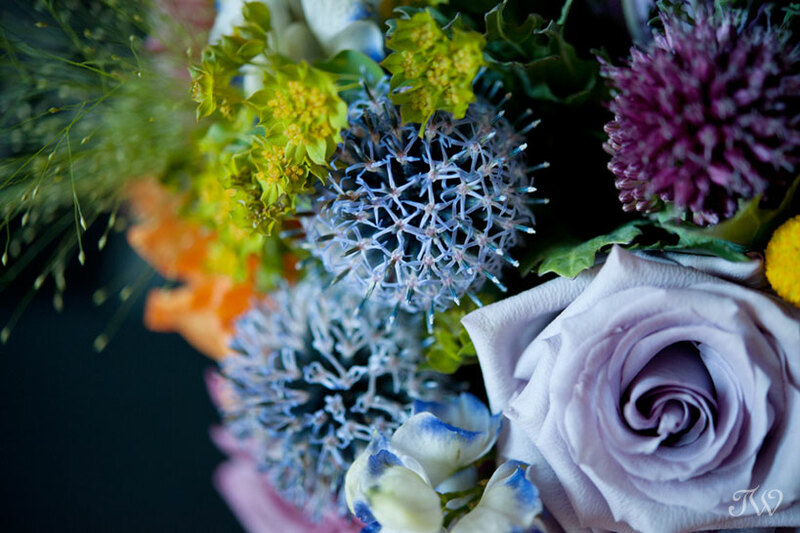 Remember this pretty wedding bouquet? 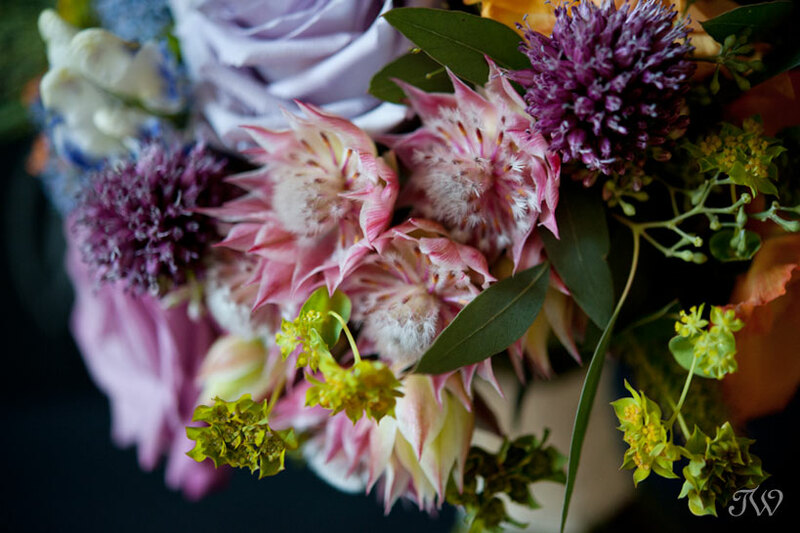 Today Janelle from Flowers by Janie is going to break it down and tell us all about a few of the blooms that make it so unique, Blushing Bride and Echinops. 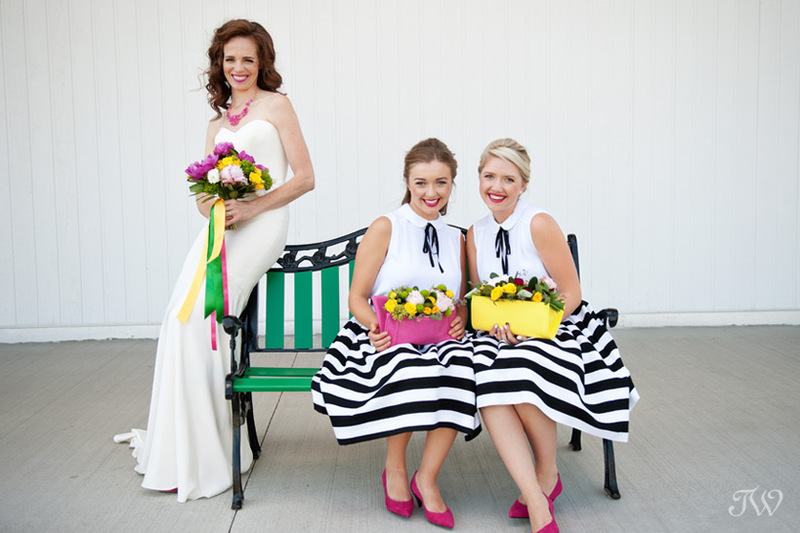 Brides planning a summer wedding, pay attention! 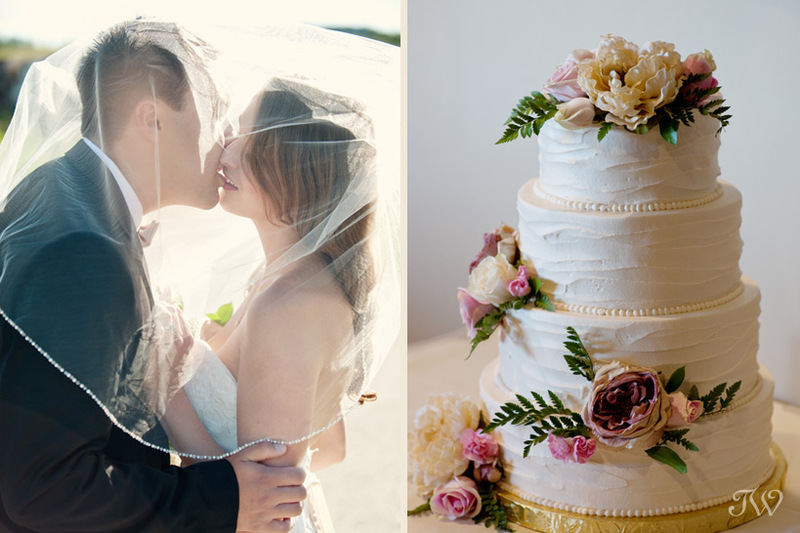 Blushing Bride…could there be a more perfect bridal flower (besides the peony)? 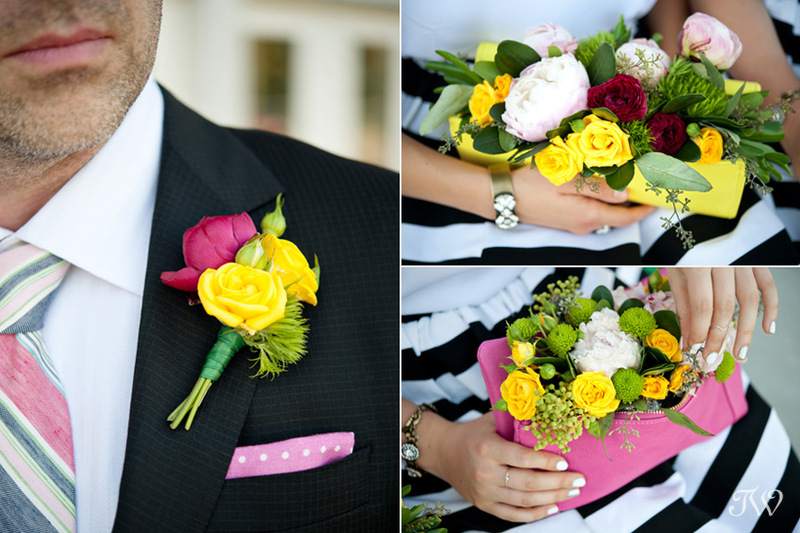 The name itself is fitting for one of the most popular summertime wedding flowers around. 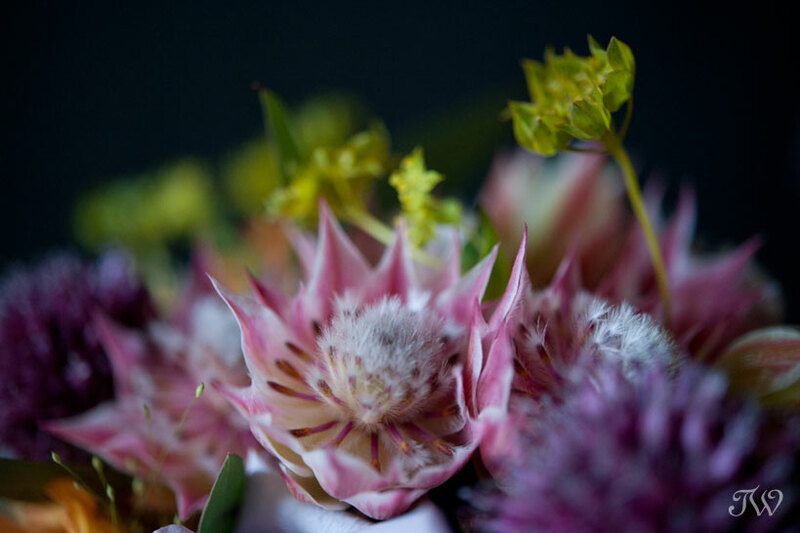 The Blushing Bride is native to South Africa and is actually a type of protea. 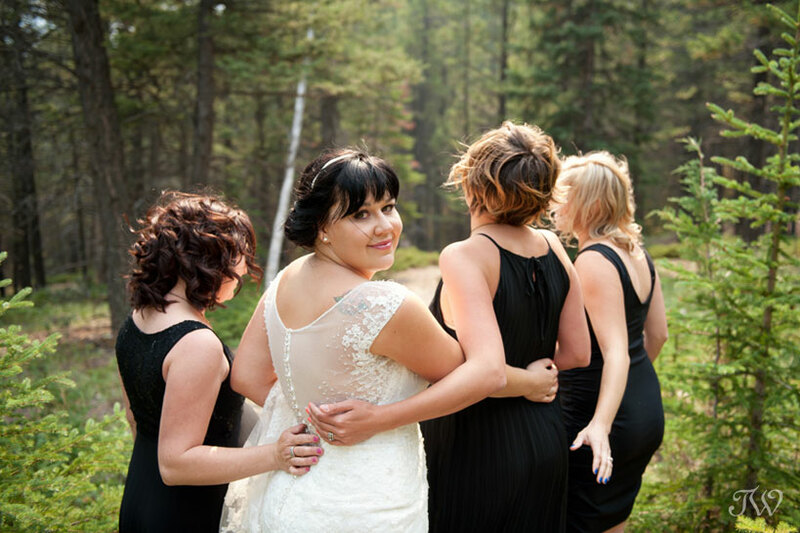 It has a short availability season for our brides here in Alberta, Canada from mid-July to late August. As peony season winds down in July, the Blushing Bride could be your perfect summer wedding flower if you are looking for a unique flower to include in your bridal bouquet or centerpieces. 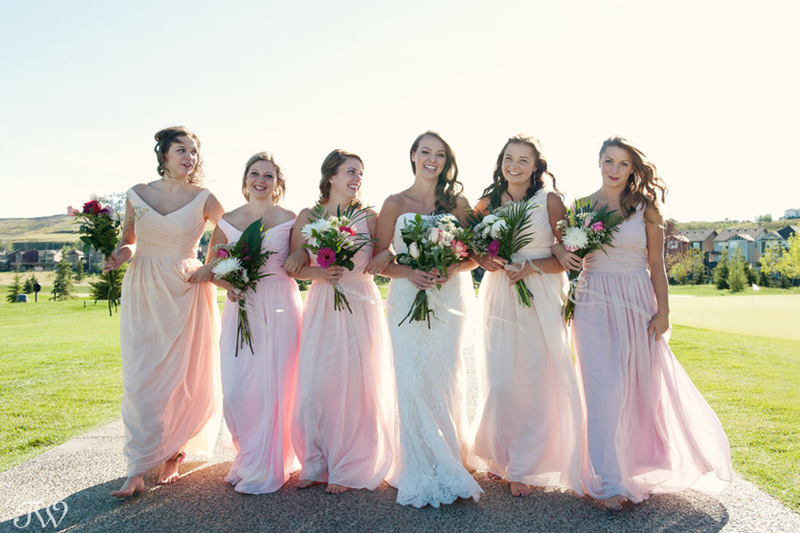 Blushing Bride has soft, feathery blooms and is available in white, cream, soft pink and a medium pink hues. Echinops, also commonly known as the globe thistle, is a flowering plant that I’ve seen more commonly in midsummer gardens rather than in wedding design work. The leaves of the echinops are sharp and have prickles on them as well as the globe of the flower. As the echinops matures and blooms, the prickles on it’s globe-shaped head turn into a beautiful steel blue spherical flower. 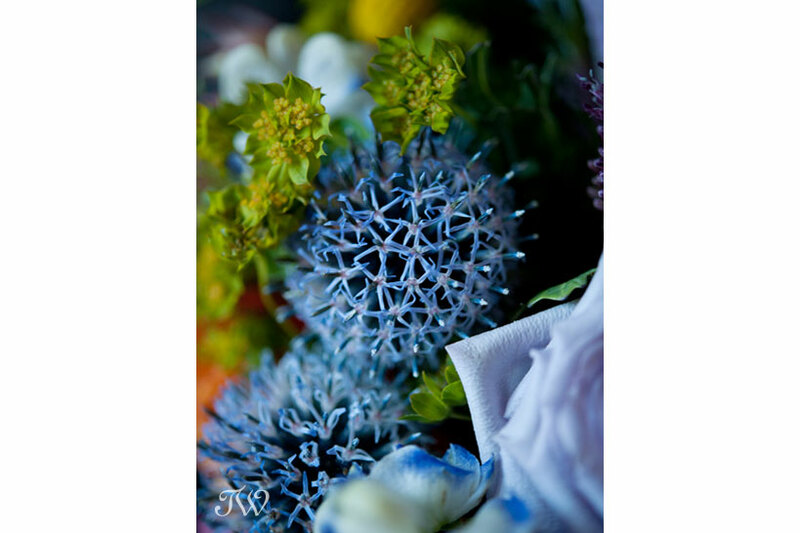 If you are a bride looking for a unique, blue wedding bloom with loads of texture and an interesting shape, the globe thistle might just be the flower to incorporate into your wedding florals. 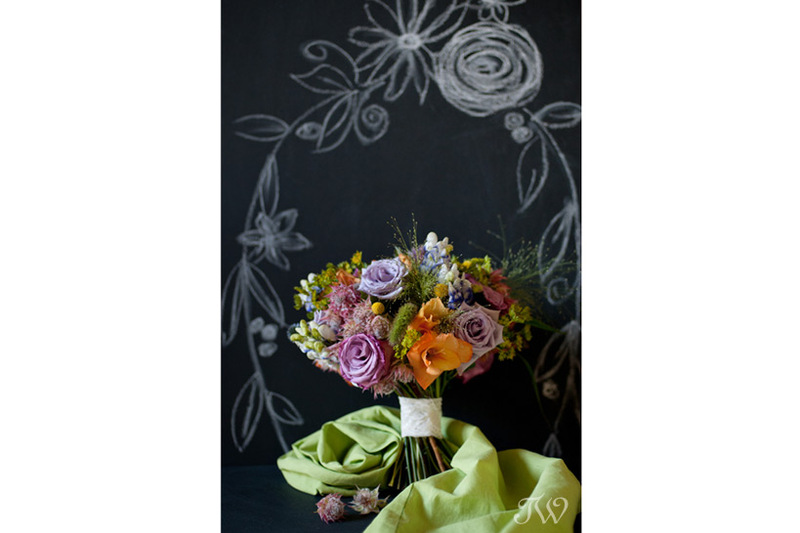 Flowers by Janie does beautiful work. Remember this coral peony bouquet? 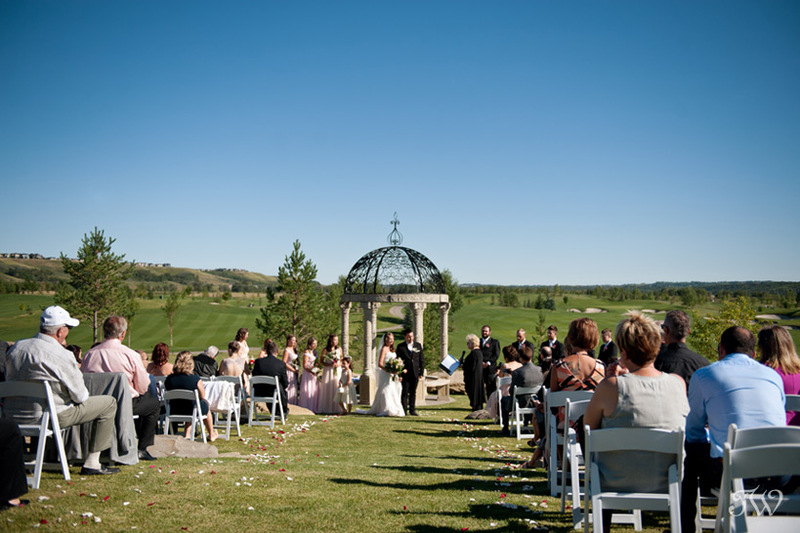 Here’s another outdoor ceremony, held at an Okotoks ranch, if you’d like to see. Fall is definitely creeping up on us but before we retire our sunscreen and flip flops, I thought it would be fun to team up with Janelle from Flowers by Janie again for a summer “bloom of the week” series. One of the unexpected treats of being a wedding photographer is enjoying the beautiful wedding flowers and the blossoms this summer have been especially lovely. 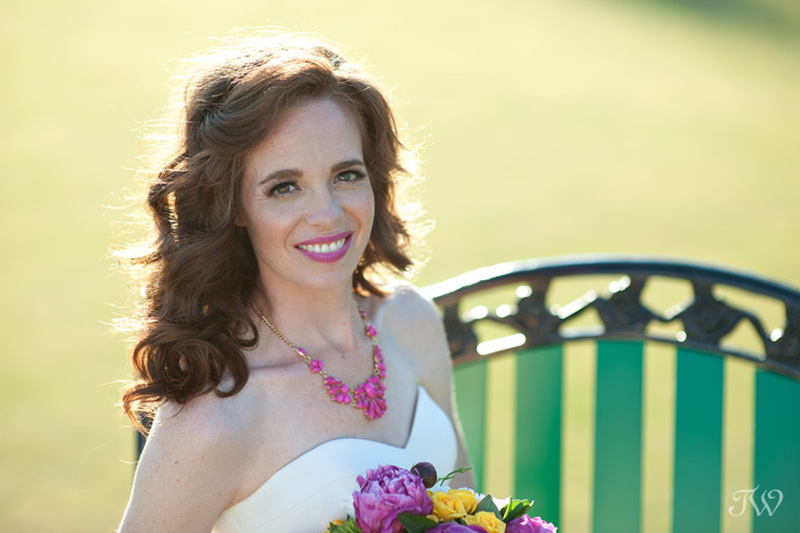 Be sure to stop back this week when Janelle will break down this beautiful bridal bouquet and tell us about the unique blooms she used to create it. Did you catch our bloom of the week series back in the spring? Take a look.